I absolutely love it when a local and free event is put on. It engages the greater community and really shows off how creative this little place I live in can be. So when I found out about Light Up Poole a few months ago, I was prepared to be amazed. 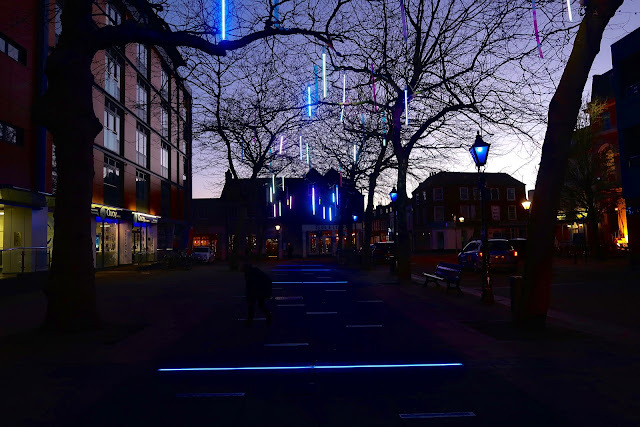 Light Up Poole is an immersive light event that follows a trail throughout the whole of Poole high street and quay. Let's just say, we were totally blown away! Based across the 15th-17th Feb between 4pm and 9pm, the whole of Poole has lit up in a multicoloured, immersive experience. Light Up Poole consists of 14 different areas. 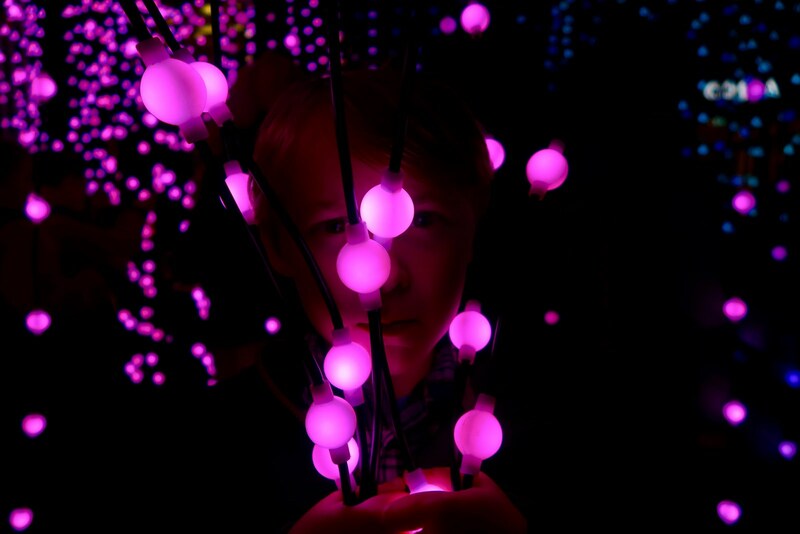 Each one is either an interactive experience, an installation or a digital light experience. They are set out in a really simple layout so you can walk from one end of the high street to the quay and not miss anything out. We took our time with each installation and managed to get through it all within 3 hours. That included stopping to dance at the silent disco, ask lots of questions and even pick up some sweets from our favourite sweet shop. We wrapped up warm and didn't feel the cold much at all as we took everything in. Whilst the whole experience was amazing, and a fantastic evening was had by all, we definitely had our favourites. 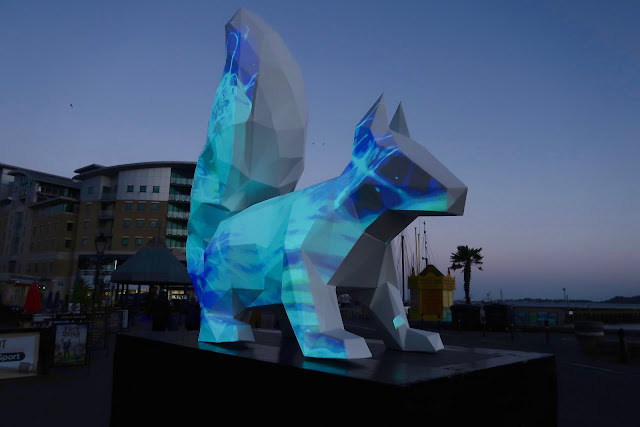 The squirrel (pictured above) was an amazing statue with projections all over it by Tim Boin and Dave Lynch. This sculpture was really a stand out against the sunset of the quay and had us mesmerised as it scrolled through colours, patterns and addictive visuals. Next up was Arbour by Mark Parry. Set up down near the quay, this installation involved lots of lights hung from the trees to create a magical light display. It was a fantastic look at man made and natural mixing together and the kids loved running up and down the path as if they were on a catwalk. Finally, the stand out installation for us was Submergence by Squid Soup. A large, walkthrough experience that makes it feel like your are walking through sheets of light. 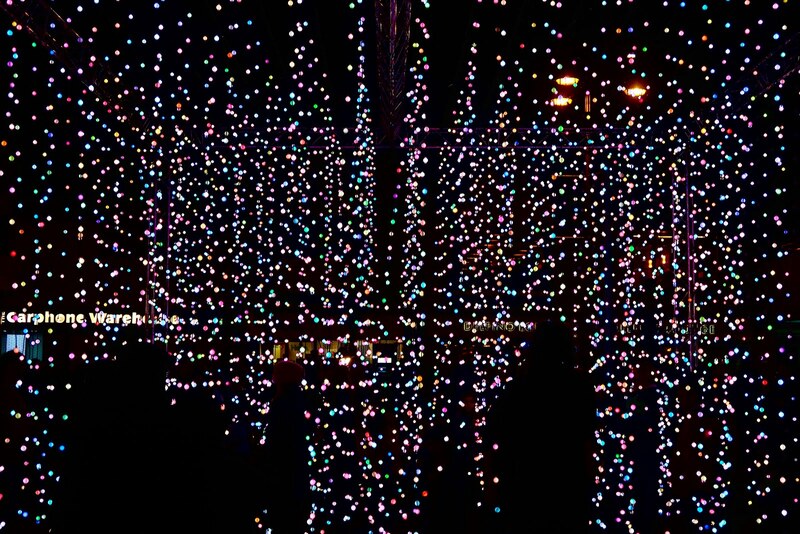 Lighting up in accordance to sounds and music, these suspended lights are just breathtaking. We wove our way through them, took photos, danced and stood back to watch everything from afar. It was one that we wanted to stay in forever, and if it weren't so cold we probably would have done! 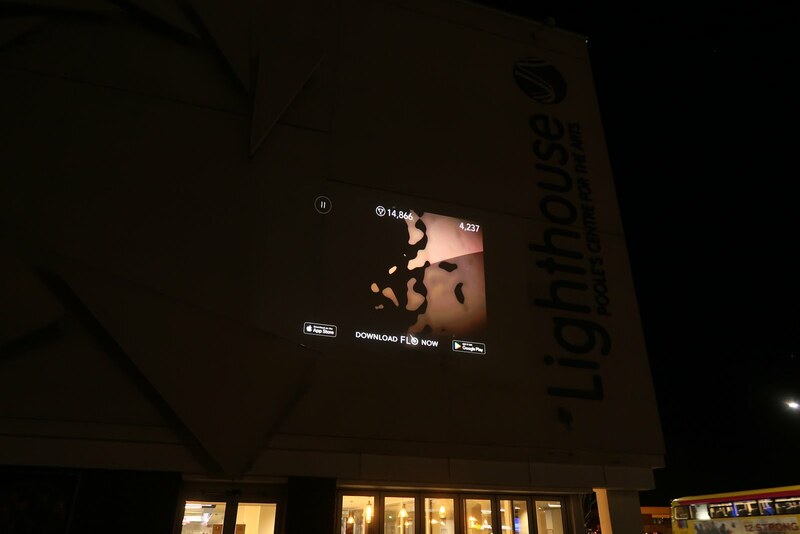 Light Up Poole is the community arts festival that we all need. It brought together so many different people that wouldn't normally experience art in traditional forms and amazed and impressed them. It was so good that I know I'm going to be back over the next couple of days, just to take in those other bits that we may have missed. It's on from 15-17th February, with the lights being switched on between 4pm and 9pm. And did I mention that it's completely free? Go and take in Light Up Poole, you won't regret it!